Rob, Your premium notification software was able to get me 2 22.4 hour trips credited for August due to schedulers errors. So thank you for a great product and helping find a way to keep the company honest. I was remiss in not Thanking you for the incredible, awesome programs. Know you've single handedly increased the QOL for so many. Thank you. Hello Rob, First l want to Thank You for a truly outstanding product. LiteSabre has been both a pleasure to use and a much needed tool to improve my schedule each Month. Second, my 65th birthday was on the 25th and l flew my last AA flight on the 24th. Therefore, would you please close my LiteSabre account. Best of luck to you as the AA bid system changes. I have greatly appreciated your help. I'm at home on my day off. My text message alert goes off. I see it is LiteSabre and I now have a MIA turn on Friday, Oct 7, which I had programmed in to be picked up. How cool is it to live your life relaxed knowing that if and when an eligible trip comes up, I have a fantastic chance of getting it. This is so fantastic I can hardly stand it. Thanks for your hard work on your end to make my life easier for less per month than my dinner bill on a layover. I used LiteSabre for the first time yesterday. Sitting at the gate just prior to push I got a message saying that my sequence had a discontinuity or such. I thought that was strange, must be an error but then, I got an ACARS message from dispatch saying "do not push. Contact scheduling immediately". Scheduling's new phone system crashed and I was being rescheduled at the last minute. It was in my Hi3 before anybody could contact me! I have an unscheduled DH on my last leg and I was again notified by the messenger before scheduling. Now it has checked me in! What an incredible system LiteSabre is. Thanks. Rob, You are the greatest! Sitting reserve and went from FB Lima to FO OGG (DEADHEAD) because of a text I got from your app!! My retirement from American is on 13DEC. Unless there is a great use for litesabre in retirement that I am not seeing, I suppose I should cancel my subscription on 13DEC. LiteSabre is a great product. It helped me tremendously on all my flights. On behalf of my passengers, all the jumpseaters and commuters I got on and certainly from myself, thank you for an absolutely terrific product. Worth every cent I paid for it. Thanks again. Initial Help. Read this if you are new to LiteSabre. NOTE: If you don't get an answer to your question on this page, try asking it in C&R. There you will find an active community of LiteSabre users ready to help. Click on a link below to see the help contents. I can't login, or the app does not stay logged in. If you have the correct usename and password, and when you login to any web app it returns to the home page, or goes back to the login screen, it's most likely due to the cookies. Try these steps in this order. If you are on an iPad or iPhone, you might be in Private Browsing mode. Exit this mode. Read more about Private browsing HERE. Delete all cookies and data from the browser. Then try the above link again. Will litesabre work on my iPad? You can manage your 24s from Nimble Trader. Just drag any future 24 to the trash can to drop it, or to another date in the future. Nimble Trader is available only in a laptop or desktop, and must be used in the Google Chrome browser. Go HERE in Chrome to get Nimble Trader. You can also move DFPs in the My Trip web app. Go HERE from your phone and choose Options -> DFP Mover. Passwords, Passwords!! My passwords don't work. Please read this page about the required passwords. How do I set up RES Code Shuffler? How do I reinstall Nimble Trader? Open a new tab in Chrome, and type 'chrome://apps' into the address bar. You'll see the Nimble icon. Right click it, and choose, Remove From Chrome. Then, go HERE to refresh it. When I try to start the nimble trader app in Chrome, I expands on the desktop, then shrinks to the icon in the bar at the bottom, and will not expand. Try pressing 'Windows Key + d key' twice. If this does not work, use the keyboard commands to relocate the program to a part of the screen you can see. Put your mouse over (do NOT click) the program in the Task Bar until the preview appears directly above it. Right Click on the preview and select MOVE. Use the arrow keys on the keyboard to relocate to a part of the screen you can see. Press the ENTER key on your keyboard when it is moved. You can then use the mouse to move and resize the window as you see fit. If this also does not work, delete the app from the browser and install it again. To uninstall, open a new tab in Chrome and click the "Apps' icon on the upper left. when you see the Nimble Trader icon, right click it an choose Remove From Chrome. I can't access the Auto Trade and Auto Drop panes. The are blank. This can occur on an older Mac computer. Open Chrome, and search through all the “Advanced” settings in Chrome. Under “System”, look for “Use hardware acceleration when available”. If it's selected to “ON”, change it to “OFF”. Re-launch Chrome, and then restart Nimble Trader. No. All new subscribers will now be able to enter a credit card directly into the LiteSabre My Account page. Only members who signed up in 2015 or earlier have Paypal recurring payments. If you have a Paypal recurring payment set up, and would like to switch to direct credit card entry, please cancel the recurring payment in Paypal, then go HERE to enter a credit card. (please wait until Paypal sends you the payment cancelation email). How do I change or cancel my automatic monthly payments? To change or cancel an existing subscription just go HERE. If this page does not show a method to enter a credit card it is because you have an existing Paypal recurring payment. In this case, contact Support to cancel a failing Paypal payment plan. Once canceled, you will be able to enter a credit card directly at the above link. I no longer see the phone and text links next to a pilot's name in the NS. What changed? In order to see the phone and text links in the NS, you must have a valid APA password on file. If you changed your APA password, or it was flagged as invalid for some reason, you will no longer get the links. To remedy, if you have a valid APA password, enter it HERE. How do I clear the data on my mobile phone? To clear the data on an iPhone, go here. To clear the cache on Android, go to Settings -> Apps -> All -> Browser -> Clear data. Every time I open My Trip, I get a No Active Connection message in the upper right corner. Normally, this message will appear if you are offline; however, some mobile users have reported this with a good connection while using the Firefox browser. Please either use only Chrome or Safari. LiteSabre checked me in automatically, but I am not on the upgrade list. Why? LiteSabre uses aa.com to check you in, and there is no way to put yourself on the upgrade list that way. But, your position on the upgrade list depends on when you checked in, and not when you put yourself on the upgrade list, so just tell the agent you want to upgrade, and she will put you on the list in the order of when you checked in. LiteSabre is not syncing with my Google calendar. LiteSabre will import active sequences, vacation, training and other 'HI10 Events' into the Google calendar. Here's how it works. LiteSabre takes a snapshot or your HISEQ, HI3, HI4, HI5 and HI10 and determines which of your sequences is in the future. It then uploads all legs of all sequences that are relevant. I've been using my iPhone/iTouch/iPad with Google Sync today with your new update. Thanks for the ability to update via the website. After doing some updating I'm beginning to think that my problems with Google Sync may have to do with my iPhone/iTouch/iPad syncing with Google rather than with your Google Sync. The first time I had problems it was always with the calendar on one of the iOS devices. I thought I also checked my calendar via Google's website, and entries weren't right, but now I'm not sure. Today I did an update and my AA schedules on my iOS devices weren't right, but they were on the website. Since I thought you said you have an iPhone you probably already know this. There are two ways to set up iOS device calendars to update with Google. One is using the Microsoft Exchange mail choice, the other using the Gmail choice. I had been using the Microsoft Exchange set up. I switched my iOS calendar updating to the Gmail set up and all the Google Sync entries are right on my iOS devices. So it seems like the Microsoft Exchange set up may have been my problem. My calendar has duplicate entries. How do I avoid this? LiteSabre will ensure that you do not have duplicate entries by erasing all invalid events that occur in the future when performing a 'Google Sync'. Make sure no events are retained by a third party program such as iCal or Outlook. It is possible to re-introduce invalid sequence events depending on the syncing priority between Google and the third party program. Avoiding this duplication in iCal requires that you "subscribe" to the Google Calendar by pointing iCal to the link on the Google Calendar's site and delete any CalDavs. Now, all the devices (iPhone, iPad) show the subscribed Google Calendar and the sync should not produce duplicates. On google calendar page on the margin under "my calendars", a drop box appears next to the calendar you wish to sync. Choosing "share this calendar" from that leads to a page of three tabs of which you're on the middle tab. The left tab is called "calendar details" and there you'll find an iCal link for the "private address" at the bottom of the page. This is the subscription link to copy and paste into iCal's subscription area. Thats the google side of things. Don't forget to delete the caldav account or you will have two of the same calendars in iCal. I use iCal. Does LiteSabre support synching to iCal? No, and yes! LiteSabre only writes and edits a Google calendar, but you can subscribe to that calendar in iCal, so your iCal is always up to date. Simply create a google account if you don't have one already, and follow the instructions here to set up LiteSabre to access and edit it. Then, in Google calendar go to 'Settings' (look for the gear on the right of the page) -> Calendars -> Share this calendar (for the calendar that LiteSabre writes to... there may be more than one)-> Calendar Details ... and look at the bottom of that page where it says: Private Address. Click the 'ICAL' button, and copy that URL. Then, go to iCal and click the menu 'Calendar' -> Subscribe. Then, paste that URL there. That's it. Now, every time LiteSabre updates your Google calendar your iCal calendar will update when you refresh it. I am trying to view next month's pairings, but the screen is blank. Set Trips up this way. What is the difference between the Trade and Drop buttons and the blue Auto Trade/Red Redder button? The Trade and Drop buttons allow you to attempt to trade a trip immediately, and the other button is used to set an Auto Trade or Red/Redder trade. +HTMD ... add the HTMD code to the trade, which will automatically move DFPs to accommodate the trade. (Most common). -HTMD ... Don't add the HTMD code. DFPs won't be moved, but if there is a conflict, the trade will fail. Auto Trade .. Set this trade into Auto Trade so that it will be tried when TTOT opens for the following month. Red/Redder .. Set this AFTER TTOT has opened for the following month, only when a trade you already tried failed for RED/REDDER. These trades will be retried periodically in case the lights change. I'm trying to trad a trip, and I get a TTOT OFF ENTIRE ACTION IGNORED error. 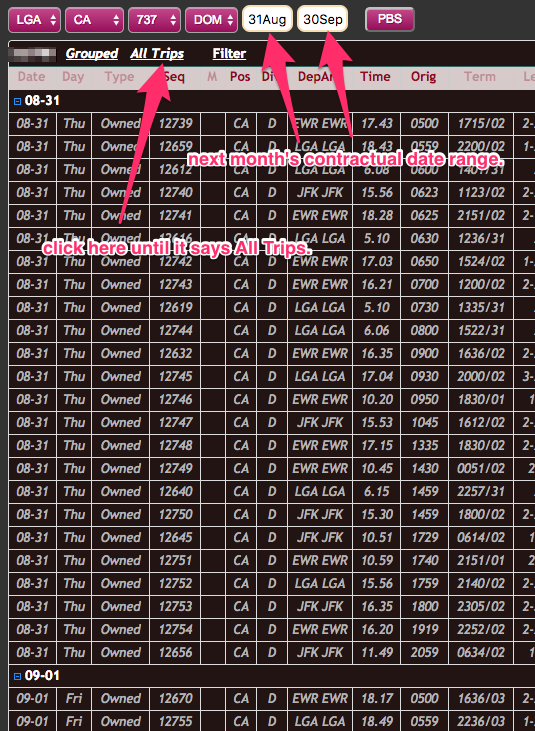 You are either trying to trade a trip that departs next month, and TTOT is not open for the month yet (it opens on the 24th), or you are trying to trade a trip that departs in the last 6 days of the contractual month, and you are between the 13th at 1200 CT and the 18th at 1700 CT. This is a PBS restriction. The app is sluggish on my Android phone. If you are using Chrome, try the Puffin Browser, available in the Play Store. It has better performance stats. How do I post my trip for drop in DECS? Just go to Auto Drop and choose a drop type, click the Submit button that pops up, and LiteSabre will automatically post it for you in DECS. NOTE!! You should receive a confirmation notification when your HISEQ is updated. If you do not get this notification within 3 minutes, contact support!! How do I UNpost my trip in DECS? Go to Auto Drop and set your trip to Do Nothing or Notify Only. This will unpost the trip in your HISEQ.You will receive a message when the change is made. If you don't receive a message, contact Support. How do I drop all of my trips? Just set them all to either Drop/UNC, Drop/PVD, or Drop/VAC. LiteSabre will drop any trips that are GREEN. What does UNC, PVD, and VAC mean? UNC means you will drop the trip for no pay or credit (uncredited). PVD means you will drop the trip for future vacation days. VAC means you will drop the trip for current vacation days. Read THIS for more info. If a trip arrives after midnight, how many days is this considered to be? Normally, if a trip arrives after midnight HBT, it is considered by LiteSabre to be another day. For instance, if a turn departs at 1600 and arrive the same night at 0012, it is considered a 2 day trip. There are exceptions to this rule however, when you create a request with time ranges that span midnight. The Auto Trade tutorial found HERE gives examples of exceptions to this rule. Since many lines now have more hours and more days in them, the DFPs do not have any place to move on some lines. Some pilots are building their lines up to nearly the Max of 92-96 hours and then trying to trade. This is resulting in failed trades due to DFP problems. 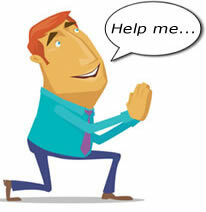 To alleviate this do the following before setting any auto trade requests, drop a few 24s. HTMD is a DECS code that specifies whether or not you want your duty-free periods (DFPs) to be moved in order to accommodate a trade. Most pilots don't care if the DFPs are shuffled around or not, they just want the trade to go through, but sometimes pilots don't want their DFPs to change, usually so they can have some control over training. In that case, choose -HTMD when creating an Auto Trade request. If you don't care about DFP position, then choose +HTMD. Is LiteSabre hooked up to TTS and TTOT? No. LiteSabre only interacts with TTOT, and can automatically do pilot to pilot trades through FOS. It does not interact with TTS. How do I fix the UNABLE TO REPLACE DFP or a CONFLICTS WITH MONTHLY ACTIVITY message? You are getting this when trying to trade or pickup when there is no place to shuffle the DFPs ('24' on your HI1). You must drop one or two of them, in order to make room for the trip you want to trade into. You can drop DFPs easily in the DFP Mover. Go here, then Options -> DFP Mover. Are multiple layover city requests treated as "OR" or are they treated as "AND"? For example, if I have both CDG and MXP in the desired layover cities box, will it award me a trip with either of those layover cities? ANS: 'OR'. If either of the cites are visited that you list in Desired Cities, liteSabre will attempt to trade onto that trip. How do I trade with a trip that is listed as Sick? Sick Pending trips are not open, they are still owned by the pilot who is on the sick list. Normally, if he remains on the sick list, scheduling will remove him the day prior, too late for you to trade with it. To fix this, contact the pilot directly, and ask if he intends to stay on the sick list for that trip. If so, ask him/her to contact scheduling through the LiteSabre HISEND App, and tell them that he will not be flying that trip. Scheduling will then drop it into open time. IMPORTANT: If you want that trip, set up an Auto Trade request before you contact the pilot. This way, when it hits open time you will have a good chance of picking it up or trading with it right away. Do not set a Red/Redder in this case. It must be an Auto Trade request, using the Create New button. LiteSabre did not pick up a trip that was in open time. Why? If the open trip already exists in open time before you enter a request for pickup or trade, LiteSabre will not react to it. It only takes action on trips that "appear" after you set a request. The exception to this is when TTOT opens for the following month on the 24th at Home Base Time (HBT) (for the next month), and on the 18th at 1700 CT (for the current month). At that time, all appropriate trips are considered "new" and LiteSabre will take action with reference to your trade requests. How does LiteSabre decide who gets an open trip? Can I sort my requests so I can get the best open trip possible? You must understand that open / posted trips are processed as if they are the only trip available.. so, once a trip comes into the system that meets your criteria, liteSabre will trade for it. TTOT is a first-come, first-served system, and liteSabre has no way of knowing when another trip may open that you want more than the one that is being examined... even if it is in the queue. The sorting you see on the Auto Trade page allows you to sort your requests, but only as they all pertain to one open trip, not multiple trips. How do I set up alerts for trips that come open during the month? Easily. Just click the 'Create New' button to create a new Trade Request in Auto Trade (Desktop version), and set it to "Verify First". For the mobile version of Auto Trade, go here and choose Options -> Auto Trade. You cannot pickup Out of Base (OOB) trips using TTOT, which is what Litesabre uses, and the reason you are getting this error. You must put yourself on the OOB list at www.aapilots.com -> Personal & Profile -> Out of Base Pickup, then wait for scheduling to call you. You can use LiteSabre's Auto Trade to alert you to OOB trips, without being on that list. Just make sure that when you get an alert for a trip you want (same day or next day only), immediately go to aapilots.com, put yourself on OOB, then call scheduling. They probably already checked that list, and did not see you on it, so you must call them. I was told I could pick up a trip posted before TTOT starts without calling the trip owner. How? Easily, by using the Trips app. Just search for the posted trip, and if the owner is a LiteSabre member, you can pick it up without contacting him/her. Non-Litesabre member trip owners still require contact, but LiteSabre will provide you their contact information when you try to pick up the trip, if this is the case. Tell me more about Auto Trade. -You will get trade alerts when trips open up, regardless of the month. -If a trip is posted before TTOT opens and you have an alert for it, you should get the owner's phone number displayed when you click the text message. You will not get an alert if your request is set to Trade Immediately, since you won't be able to immediately trade it. -Immediate trades are ignored before TTOT starts. -8 minutes before TTOT starts trade requests are queued, CANNOT BE CHANGED, and timed for when TTOT starts. Trade alerts are turned off for that 8 minutes window, so you won't get flooded with text messages. --Simple rule of thumb. Set alerts when you want to call the trip owner and grab the trip before TTOT opens. Set Trade Immediately requests to grab trips when TTOT opens for the month. How to I change my four part status? ​LiteSabre will automatically detect this after your HI2 is populated with next month's bids. This works for all pilots except Check Airmen. Check Airmen must manually enter their 4 part status here. You can move DFPs in the My Trip web app. Go HERE from your phone and choose Options -> DFP Mover. You can also manage your 24s from Nimble Trader. Just drag any future 24 to the trash can to drop it, or to another date in the future. Nimble Trader is available only in a laptop or desktop, and must be used in the Google Chrome browser. Go HERE in Chrome to get Nimble Trader. I put in a trip to trade red/redder. It accepts. It tries once. Says your request is dropped because sequence not open. I thought it was supposed to try every 60 minutes? When you enter a Red/redder trade, litesabre tries to trade your trip for the open trip, and if the trade fails because your trip is redder than the trip you want to pick up, liteSabre will retry the trade periodically, hoping that down the road, the light statuses will change, and the trade would go through. When you enter a red/redder, and liteSabre drops the request immediately, it's because the trade failed for some reason other than the lights, and there is no chance that this condition would change in the future. This is what occurs when you enter a red/redder, trying to pick up a trip that is not open (if it's listed as Sick, read the next FAQ). It's impossible to trade your trip for a trip that is not open, so liteSabre rejects the request. I set a Red/Redder for a Sick Pending trip, and liteSabre dropped the request immediately. Why? What is available for reserve pilots? LiteSabre has two features built exclusively for reserves. HIRPB Builder. This app allows you to easily build HIRPB requests with drag and drop. Set sequence choices and Raps. Go HERE, and choose Options -> More -> Reserve. Also, read the HIRPB Tutorial. Automatic notifications for open sequences that depart today or tomorrow, filtered for legality, and DFP conflicts. LiteSabre automatically identifies when you are on reserve, so there is not set up required by you. A special Auto Trade request (ID 7777) is created and modified each day to cover today and tomorrow. Of course, reserve pilots get the benefits of Delay Minder, My Trip Fetch, Commuter Pal, FAR 117 and Deadhead Seat Changer (a godsend, since reserve pilots deadhead more often than line pilots). Also, check out HISEND, which allows you to more easily communicate with Scheduling.